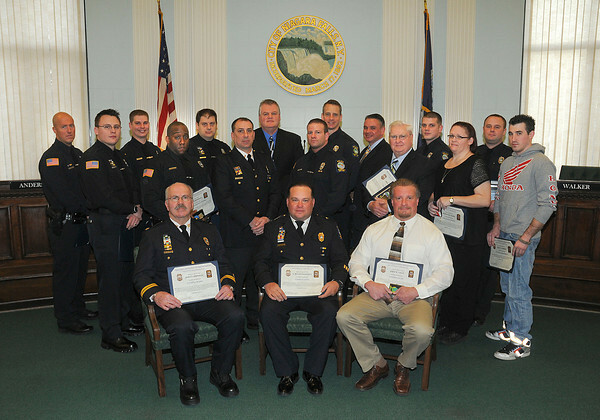 James Neiss/staff photographerNiagara Falls, NY - The Niagara Falls Police Department handed out awards and promotions during the Annual Awards Ceremony at City Hall on Friday. From left, in back are, Andrew Pappas, Theodore Weed Jr., Michael Drake, David Legault, David Cudahy, John Conti, Shawn Watson and Shaun Bielec. Middle from left are, Michael Tarnowski, Ken Henderson, David Kok, Troy Earp, Bernard Stack, Marilyn Clark and Matthew Robbins. In front from left are, Captain John DeMarco, Police Superintendent E. Bryan Dalporto and Detective John Galie.Leo Maj Memorial Award: Officer David Cudahy.Distinguished Junior Officer Award: Officer Shaun Bielec. Distinguished Senior Officer Award: Officer Michael Drake.Chief's Award: Captain John DeMarco, Lieutenant David Kok, Captain David Legault, Captain Salvatore Pine and Law Advisor Bernard Stack.Outstanding Detective Award: Detective John Conti.Combat Cross: Lieutenant E. Bryan Dalporto and Detective John Galie.Honorable Service Medal: Troy Earp, Ken Henderson, Andrew Pappas, Michael Tarnowski, Shawn Watson and Theodore Weed Jr.Life Saving Medal: CRT Marilyn Clark.Civilian Achievement Award: Matthew Robbins.